In a shoe making process sole adhesion and other cementing is most important for making a better shoe. I mention here 10 best points for good cementing. 1. Do Roughening and scouring of Uppers/Soles properly and remove dust (follow-procedure). a. Wipe brush for using P.U. cement with M.E.K. b. Wipe brush for using Neoprene cement with Toluene or petrol. c. Wipe brush for using latex with petrol. 3. Use primers depending the suitability of material. Before cementing use primers and ensure proper drying. Drying time should not be less than 1 hour in case of halogenations (T.C.T. solution). 4. To avoid contamination keep the wiped surface upside down. 5. Ensure sufficient drying time (follow procedure). 6. Ensure proper temperature for heat-reactivation (follow procedure). 7. Ensure sufficient time for reactivation (follow procedure). 9. 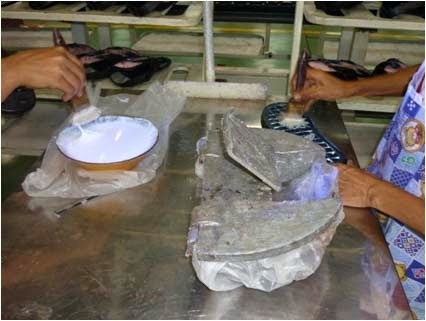 Ensure proper pressing (follow procedure) maintain uniform pressure all over the sole. 10. Ensure sufficient time for pressing (follow procedure). 11. The surfaces where cement to be used must be clean and free of dust and moisture. These are the points for good cementing of a shoe.